Once you bring your kayak home remember to feed and brush it twice a day, and make sure it has lots to chew on. Just kidding. That’s puppies! Storage solution in a small apartment from the clever Thorsten in Germany! Storing under a tarp is alright in the short run, but a framed tarp-shelter is best to keep the tarp off the kayak to maximize airflow. For humid climates, storing the kayak indoors is best. 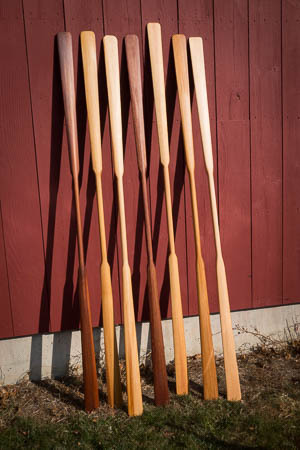 If you live in a humid area or if your kayak doesn’t dry fully after paddling, you may notice small dark spots form along the bamboo ribs. While a tiny bit of mildew or mold will not harm the boat, it can be unsightly and is easily removed. Seawolf now pre-treats all of our ribs with a diluted Tim-Bor (Borax) solution (1:5). Older boats that develop mold spots may be treated after the fact. 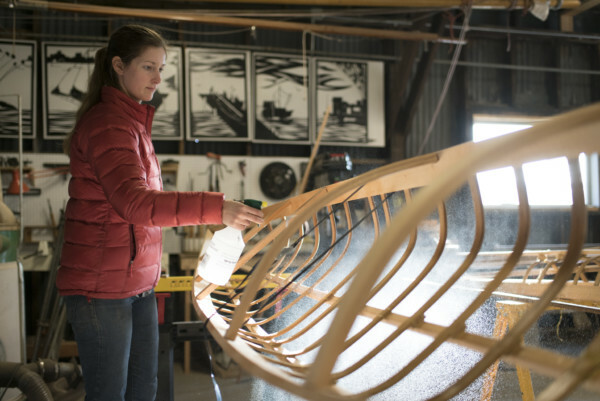 The best time to treat the boat is during frame construction. Spray down the ribs, let them dry, then rub with linseed oil to seal in the treatment. Pretreating with Borax will prevent mold spots from forming. A diluted bleach solution spray can be used to kill any pesky colonies already formed, and keep future ones from forming on the ribs. While the poly-coated nylon skins are ultra-tough, SOF kayaks are prone to abrasion, especially if dragged over a beach or run up on shore when launching/landing. If you see signs of wear, or manage to puncture the skin, a simple patch may be all you need. For small patches, we recommend Gorilla-brand Clear Repair Tape. The clear tape won’t mar the aesthetic of the boat, and unlike other brands the tape is waterproof and sticks well to the poly. For scuff and tears, layer 3-5 pieces of Gorilla tape. Need to replace the patch? Simply peel it off and replace with new tape. How long the skin of your boat lasts depends entirely on how the boat is used and stored. Some kayaks built in our workshops have their original skins, if not with one or two patches, after 10 years and counting! Kayaks taking on a high level of abuse without proper care will need a fresh skin long before then. See our post on Re-Skinning a Skin-0n-Frame Kayak. Replacement skins and polyurethane (or goop) can be ordered from the Skin Boat Store. While your frame may need minor repairs before re-skinning, with proper care you can expect a good frame to well outlast you and me. Fill with wood glue or Gorilla glue (for a faster set). Clamp and set according to glue instructions. Sand. Get back out there.